With just days left in 2018, I cannot help but look back on what an amazing whirlwind this year has been. My family welcomed a baby boy in January, our girls both started new schools (preschool and kindergarten) this fall, and our oldest son has grown leaps and bounds both socially and academically. My family implemented 1-on-1 dates for my husband and I to each take turns spending time individually with each child. I have loved having that special time with each of them so very much. This year I grew friendships (see below regarding a videographer partnership for one! ), I took on a fitness/health challenge, and I worked on better self-care and self-grace. All of these things are still works in progress, but I look forward to all that 2019 may bring for me and my family. I photographed both new families and returning ones. I am grateful for each family who welcomed me into their hospital rooms during those first hours with your newborn baby. I captured many newborns, both first born babes and siblings. I had the pleasure of meeting so many new families this year along with lots of long time yearly families. (I am so thankful for those of you who referred your friends to me, it is because of you that my small business has grown like it has). I added custom albums for all family and newborn sessions. After being in business for 9 years, I have tried many different options for packages. Two years ago I moved to all-inclusive and it was the best decision for both my style of photography and for the families who choose me to photograph them. I wanted every family to have all of the images in their gallery. However, I still wanted something beautiful and tangible for each family to have with their session. In the past I had tried, proofs, canvases, metal prints, and print credits, but this past year I moved to the custom 8x8 album and it felt “just right” (think goldilocks). Families had nothing but positive feedback, so I’m excited to say they are sticking around for 2019! Since I do still love canvases, families may just find a wall display option in their gallery! Through Mom & Me Mini Sessions last spring and Fine Art Portrait Sessions this fall, we helped Team World Vision bring clean water to many families. Through Santa Sessions we raised $450 for the International Justice Mission to help fight human trafficking. (Thank you to the Snoqualmie Valley Santa for donating his time and amazing talent to help make this possible). Even more, with your school portrait purchases 10% went right back to your school. It is only because of your continued support of my business that I could use my gift of photography to make such an impact in this world. It is true what they say, if you want to go far, go father together. This year we went farther! I held my first ever DSLR Summer Camp for Young Adults. If you would have asked me at the beginning of the year if I thought I would be teaching a workshop for teens, I might have laughed. However, a friend approached me saying there was nothing around for young adults to learn photography, and the DSLR Summer Camp for Young Adults was born. I was completely blown away by how quickly they learned to shoot in manual mode, and even more blown away by their eye for the world around them. At the end of the week, they unanimously agreed their favorite part was photographing the baby girl who came to model for us! I teamed up with a videographer for an amazing branding project. This year I have gotten to really know Cicely of Rusted Van Photography as we worked together on a lifestyle commercial branding project for hesmarieh jewelry. Cicely did videography while I did photography. It was the start of a friendship and partnership that I cannot wait to see where it takes us. (Stay tuned because Cicely did some videography for me, coming next year!). I won the Gold Daisy Award for the second time. I am so grateful to everyone who took the time to nominate and/or vote for me for this year’s 2018 Gold Daisy Awards. This award is a local (Issaquah, Sammamish, Snoqualmie, and North Bend) award for the most loved businesses in the area. I know you have plenty of amazing choices for photographer and I am honored you selected me this year. Thank you so very much. As I sit here looking back of 2018 I am so grateful for all that this year brought. I am grateful for every family who hired me to capture their family, for every person who recommended me to a friend, and for every person who continues to follow along with my work and my business. I am so grateful for my tribe - my parents and in-laws who help with the children, friends who listen when I need to run ideas by you (you know who you are), and my husband and my kids who support me 100%. Without all of you, I could not do what I love while helping support my family. So I end this year full of gratitude for you. Thank you so very much. Want to keep in the loop for what’s in store for 2019? Ready to get your 2019 family session on the calendar? Make sure you’re signed up for my newsletter to be the first to know. Growing up, I always had a camera in my hand. I had no idea what I was doing, but I loved the click of the shutter. I loved that I could capture those things that were important to me. I could document my life the way I wanted to. However, photography was never going to be a career for me because you have to be creative and an artist to be a photographer - and I did not see myself as either of those things. I had a dream of becoming a director of film or more likely, I wanted to work for Disney in their marketing department. After I graduated from college, I found myself with a degree in business, working at Starbucks, with no desire to sit at a desk job. The irony is that I had never imagined owning my own business. In fact, during my entrepreneurial course that was required to graduate, I often thought. "Who would ever want to run a business?" It was my husband who encouraged me to start Neyssa Lee Photography and even found me my first client. In the beginning, I was preserving a piece of a childhood I missed out on for the kids of the families that hired me. I was capturing them with their parents who loved them, and it brought me great joy. Then, when I became a mother, my life was turned upside down. I experienced first-hand how fleeting each stage with my baby was. In the blink of an eye, he went from newborn to infant to toddler. The passing of time left me longing to hold onto my tiny baby, while celebrating each milestone he passed. This paradox of motherhood made me reach for my camera even more. With my son’s growth, my photography changed. I was no longer clicking the shutter for the children, but for the mother who just wanted to hold on a little longer. Suddenly, I understood the details, the moments, the looks that all mattered. 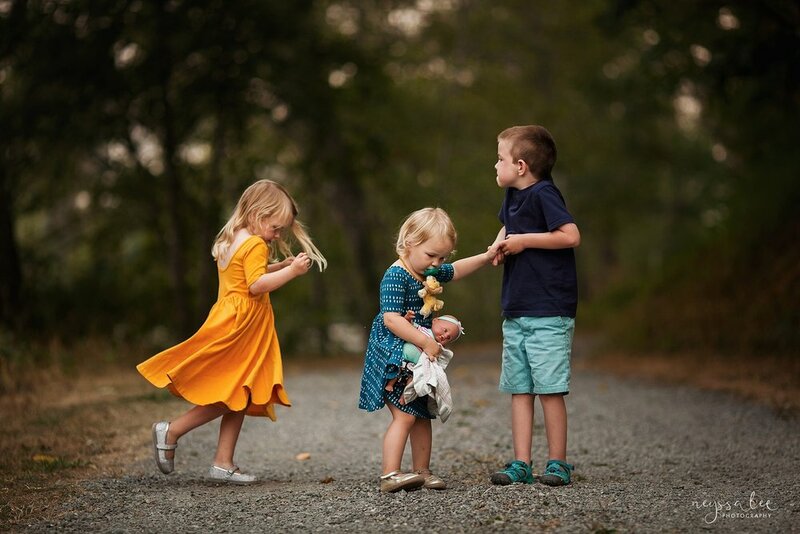 Photo by Megann Robinson - My girls meeting their baby brother for the first time. Over the course of the next seven years, I had four babies and four miscarriages. I was fortunate to have had my first two children without any problems. But it took a year and a half and three consecutive losses to bring our first rainbow baby home. When I thought I had endured enough as we tried for our fourth child, we lost a baby girl at 14-weeks gestation. We had already announced we were going to be a family of six, we had already told the kids, we had already heard our baby's heartbeat. Those years of struggle and grief made me a better, more compassionate photographer. I see each newborn as a true blessing, whether I know the entire story behind his/her arrival or not. I know the heartbreak of loss, how that baby always stays with a family. I know the sheer bittersweet joy of a rainbow baby. I see the gift each child is for a family, whether adopted or biological. Photography helped me heal a broken childhood, hold onto a family that gave me a family. It has helped cope with how fast my children have grown and move through the pain of grief. It is more than a creative outlet, it is a lifeline. I know how important photography is for myself, my journey, and my family. I bring all of that to each session, knowing it's important to you, too. One question I get asked often is what lens I used for a particular photo. Another question is what gear I use for my photos. So I thought I would share here what's in my camera bag! I will start first, with my actual camera bag. A year ago, I decided it was time to get a new camera bag, one that fit my style of photography, one that was durable, and one that didn't scream "I'm a camera bag." I did a TON of research, I asked friends on forums, and I watched videos on people using camera bags to get an idea of which bag to get. (As you can see, I'm super cool in how I use my spare time!) I decided on the Peak Design Everyday Messenger. I am happy to report that my research paid off and I LOVE my camera bag. It is comfortable to shoot with and comfortable for taking around on day trips with the family. It is super durable and I don't have to worry when I set it down on location outside. And I can also say that the customer service at Peak Design is wonderful. They accidentally sent me the 13" size when I ordered the 15" and they were so speedy in making sure I got the right bag. Okay, onto my gear. What is actually in this camera bag I love? First my camera. I have the Canon Mark iv 5D camera body. I admit that the mirrorless systems have caught my eye, however, my camera is like an extension of my body, I am comfortable with it and it still works wonderfully for me. I only have 3 lenses in my camera bag. I shoot prime lenses (which means it is a fixed focal length, if I want to get closer or further away I must move my body) only because I love the lower aperture and crisp images they create. My first, and most used for personal and newborn work, is the Sigma Art 35mm F1.4 lens. The following couple images were all taken with my 35mm lens. The next lens in my bag is my Canon 50mm F1.2 lens. I admit, this lens doesn't get as much work as the other two lenses in my camera bag. However, I've recently been using it more and reminded how much I love this focal length. It's the only lens I use for school portraits, a favorite for trips to the park with the kids, and is a great lens for family portraits. The following few images were all taken using my 50mm lens. My last, and favorite lens, is my Canon 135mm F2.0 lens. This lens allows me to get back and let moments unfold while providing such beautifully compressed bokeh. Here are a few images taken with the 135mm lens. Besides a chapstick, extra CF cards and camera battery, that's all I keep in my camera bag! Of course, I have an 85mm lens and maybe a Lensbaby Velvet 85 on my wish list, but I am happy with the gear in my camera bag now.